Not a position I expected to be in. Not today, not ever. I was walking along a highway next to the Arkansas river in central Colorado with two other men from our group. We were all wearing wetsuits, and river shoes. With each passing car we stuck our thumbs out and attempted to convince them to stop. Today we got on the water. We had 15 boys, 7 leaders and four boats. The #1 object when whitwater rafting is not to die. Seriously, whitewater rafting is one of the few recreational sports where death is a real possibility. I’ve known of people who died on this river. And we found out later that two people died today on the Colarado river. Whitewater rafting requires that just about everything go right. The first step is you have to have the right equipment. If you’ve ever floated on an innertube down a river, you might be tempted to think that rafting is similar. Only in the sense that riding the gocarts at the amusement park is similar to driving in a NASCAR race. First we all had wetsuits. The water we were floating on was snow just yesterday. It might warm up by the time it actually reaches Arkansas, but here in central Colorado it was cold. We all had close-toed shoes. Most of us had specially designed river shoes. They have mesh on top and have a good grip on the bottom to get traction on the rubber boat. They weren’t so good for walking down the highway. Lifejackets, called Personal Flotation Devices or PFDs in rafting terms, are mandatory. The same with helmets. Many of us also had gloves. Typing on a keyboard all day doesn’t really prepare you for wielding a paddle. We were fortunate to have several members of our group who had rafted this river a lot. You need an experienced guide in charge of each boat. You put your best guide in the lead boat. He picks a line through the rapids. You put the second best guide in the last boat. His job is to pick up any swimmers; rafters who failed to stay in the raft. The rest of your guides follow the leader and typically take his line through the rapids. 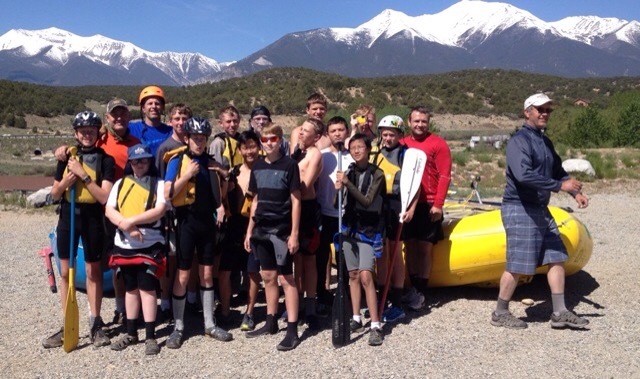 Whitewater rafting is long periods of calm punctuated by periods of intense terror. It’s important to scout the river. Water levels change daily. The Arkansas was running about 2400 cubic feet per second today. Picture 2400 basketballs going past every second. That’s going to affect the rapids. The guides really want to know what the rapids look like before they see them from the boat for the first time. Especially in a Class IV rapid. Rapids are divided in to six categories. Class I rapids aren’t really rapids at all. It’s calm water. Like in your bathtub, just colder. Class II rapids are anything that has a little bit of curl to it. You don’t really ride Class II rapids. Class III rapids is where it starts to get interesting. Most of our rapids were Class III. These have big waves, but generally you can take any line through the rapids and stay in the boat. Class IV rapids are bigger than Class III and require you take a particular line through the rapids. If you fail to take the right line, you are going swimming. . .or dying. But, probably just swimming. Class V rapids are extremely difficult and typically only attempted by kayakers, not big rubber rafts like us. Class VI rapids are impassible. Niagra Falls is a VI, as is anything that you cannot successfully navigate. We did pretty well today. Everyone mostly stayed in the boat. But, it wasn’t without injury. At lunch we pulled into the shore to break out our ham sandwiches. My boys were in three different boats. The son who was with me did great. The son with the lead boat did great, other than falling out at one point. My son with the trailing boat broke his arm. . or his collarbone. . .or maybe dislocated his shoulder. He’s a tough kid who played rugby this spring. Getting out of the boat at the lunch stop, his entire body was tense as he tried to cushion his shoulder. Even laying a finger on his shoulder brought a quick intake of breath and tears to his eyes. We had a physical therapist and an anesthesiologist among our youth leaders. They didn’t have access to drugs, but they had enough medical training to evaluate his injury. They told me it didn’t look good. Son, I think you’re done for the day. No, Dad. No. I’m pretty sure if you let me move to the other side of the boat I can still row with my left hand. Well, I didn’t raise any wimps, I guess. Nope. You’re done. We’ll fix a sling and you may be headed to the hospital tonight. Ever seen a coach bench a player and that player thinks he can still perform? Yeah, that was my son. But, we had a problem. We had intended to go another couple of hours. The rafts averaged 3-4 MPH. We were still 10 miles away from our cars. What to do? Yep, we hiked up to the road and stuck out our thumbs. I realized I had never hitchhiked before. We started to walk. Jack was lagging. It’s too far to walk, fellas. Well, walking is better than staying here and not getting a ride. Eventually a guy named Sam in a Honda Passport pulled over. He was a Colorado transplant from New Jersey. We got the impression this wasn’t the first time he’d seen similarly dressed hitchhikers. Overall, not the opening day that we’d planned on. But, tomorrow is another day on the river.